The HP 22-b016 AIO desktop might not be the most premium PC around, but for a budget all-in-one desktop, it does tick the right boxes. It comes with a space saving design and enough power for day-to-day tasks. You will love the roomy 1TB storage, good performance, attractive aesthetics, and budget price. We recommend it to users looking to do some basic productivity and handling some multimedia. If you can spare a bit more cash, the Aspire C24-865-ACi5NT AIO desktop is a great choice too. It packs a newer 8th Gen. ‘Coffee Lake’ processor, a higher-quality screen and better connectivity options. Buying a highly integrated system like this can be more than challenging for most people because it is more than your average desktop. That is because you’re buying a computer and a monitor in one and not everyone understands the limits that might arise if you ever need to upgrade in the future. As a result, you want a desktop that meets your needs and budget perfectly, and one that can be upgraded if need be. 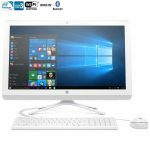 The HP 22-b016 is a great Windows alternative for budget AIO users. It might have the chops of an iMac, the best-known all-in-one, but it offers more value than most AIO we’ve seen at its price point. Aside from offering artists’ basic productivity and multimedia needs it can also sit at your kitchen desk and let you video chat with your folks back home. Additionally, it should offer great help finding recipes online, watching video clips or just plain old playing some music. Some of the most common all-in-ones we’ve reviewed in our labs were black, so seeing the HP 22-b016’s sleek white case was refreshing. The whole case is made of white plastic that represents a neat and attractive build. The bezel is a bit thicker than most premium AIOs, but nothing too scary to look ancient. It’s marred only by a webcam at the top center of the bezel and an HP logo embossed at the bottom center. Also represented at the bottom bezel is the speakers with visible grills running across the breadth of the AIO desktop. The speakers offer loud audible sound, enough to fill a room, but the quality is nothing to get that excited over. Still, while the speakers are not anywhere as incredible as on the Dell XPS 27 all-in-one, it isn’t that much of a deal breaker. They offer distortion-free audio but for this unit, you’ll need external speakers if you need home theater kind of sound setup. At 21.2 x 7.3 x 15.7 inches and 12.16 pounds, the HP 22-b016 desktop has a larger footprint compared to the Aspire C24-865-ACi5NT AIO desktop (21.26 x 0.46 x 12.64 inches, 6.9 pounds). The other favorite Lenovo IdeaCentre AIO 520-24AST 23.8″ All-in-One Desktop (8.3 x 19.3 x 15.3 inches 21.25 pounds) is relatively smaller and has a sleeker design. All in all, the HP 22—b016 has decent size and weight. If you will be moving it from room to room, it won’t break your back. The display itself is nothing special but it at least brags of an upgrade from 1600 by 900 resolution (HP 22-c010 AIO desktop) from last year. Now, the HP 22-b016 flaunts a 1,920-by-1080 resolution with anti-glare coating and modest brightness. Considering the price the AIO sells for, it’s an overall great deal. With this resolution, you get to play 1080p videos which mean faster playing YouTube videos, and streaming videos. The display also supports clear images making it great for web browsing and reading emails. Let me start by saying that the port system is modest and accommodates most of what you’ll need for basic daily connectivity. That said, we noted an optical drive (ultra-slim DVD tray) which is great because while they are slowly getting obsolete, it’s great having them for those who haven’t transitioned. The right side of the system also houses 3-in-1 card readers right next to the power button. Moving on, the bulk of the ports are located at the rear of the desktop. You’ll find a security cable slot, USB ports (2 x USB 2.0, 2 x USB 3.0), an Ethernet port, a DC power-in input, an HDMI port, and a headphone/microphone jack. Speaking of headphone/microphone combo jack, it is located at the rear of the system. For most people, this can be one of the few wrinkles they might have to deal with. Perhaps getting a headphone with long cables/wires might be a good idea if you’re planning to use this AIO for your home/office work. FYI, the mouse and keyboard will take both USB 2.0 ports available leaving the USB 3.0 port only. So you might be forced to only use the remaining USB 3.0 port for your other peripherals. Other connectivity options include the 802.11b/g/n Wi-Fi and Bluetooth 4.0. More often than not, we advice opting for another keyboard and mouse. Yes, they are both wired and that’s a relative wrinkle for AIO desktops. But again, the price does allow a bit of mediocrity in features. The mouse is sculpted to fit your hand and the keyboard decent for shot typing sessions. Generally, if you don’t have the money to invest in a higher-quality keyboard and mouse, these will get the work done perfectly. On the flip side, if your work revolves around close precision drawing and gaming, definitely get an upgrade. First of all, the webcam on the front dash is adequate for Skype and streaming video. If you’re one to video conference on Skype, Facebook Messenger or other platforms the front facing and built-in microphone will serve you well. The only downside to the webcam is the pixalation it comes in. You won’t be able to take clear still photos and the video might not be as clear as other premium AIOs. One of the biggest determinants of performance on an AIO desktop is its processor. The HP 22-b016 comes with modest components including a low-range Intel 1.6 GHz Pentium J3710 quad-core processor. The processor runs at 1.6 GHz and 2.64 GHz on Turbo which we thought is decent especially for less demanding tasks like web browsing and listening to music/ streaming YouTube videos. Combined with the 4GB DDR3 memory, videos should stream smoothly and web pages load quickly. The system can handle multitasking but not to the level other modern processors would. Today, Intel Pentium processors are more on the lower end of the product stack and they don’t provide as great performance muscle as their modern 7th and 8th Gen counterparts. Which means, this system would not be great for gaming, intensive graphics tasks or heavy editing. Upgrading the memory might help a bit but bottom line, the performance might not change a lot. For this reason, we recommend going for a more updated AIO desktop with at least 7th or 8th Gen processor. The Aspire C24-865-ACi5NT AIO desktop we mentioned at the beginning makes a bold statement here. It packs a newer 8th Gen. ‘Coffee Lake’ processor, a higher-quality screen and better connectivity options. Aside from aesthetics, what we most loved about the HP 22-b016 is the plenty of storage available. The 1TB mechanical hard drive storage provides ample room for your photos and videos. As far as games are concerned, the 22-b016 packs an Intel Graphics HD discrete card. This means the system is not built for gaming, especially recent title games. However, if you must games, it should be capable of running basic games. Avid gamers should look elsewhere, perhaps on systems like the Aspire C24-865-ACi5NT AIO desktop. Also, if you don’t mind stepping down to a desktop, the HP Omen 880-020 Desktop, Dell Inspiron i5675-7806BLU-PUS Desktop or the [Ryzen & GTX 1050 Ti Edition] SkyTech ArchAngel are great options to go for. The HP 22-b016 desktop might be a disappointment when compared to other gaming and premium AIOs. However, if viewed in the light of similar midrange all-in-ones, it makes a useful addition to a busy household. It lacks a touchscreen which makes it suitable for kitchen computing but for the price it sells for, you get a great value system that’s capable of most things. Other nicities it packs include a modest port system, plenty of storage (1TB HDD) and computing power for daily run-to-the-mill tasks. 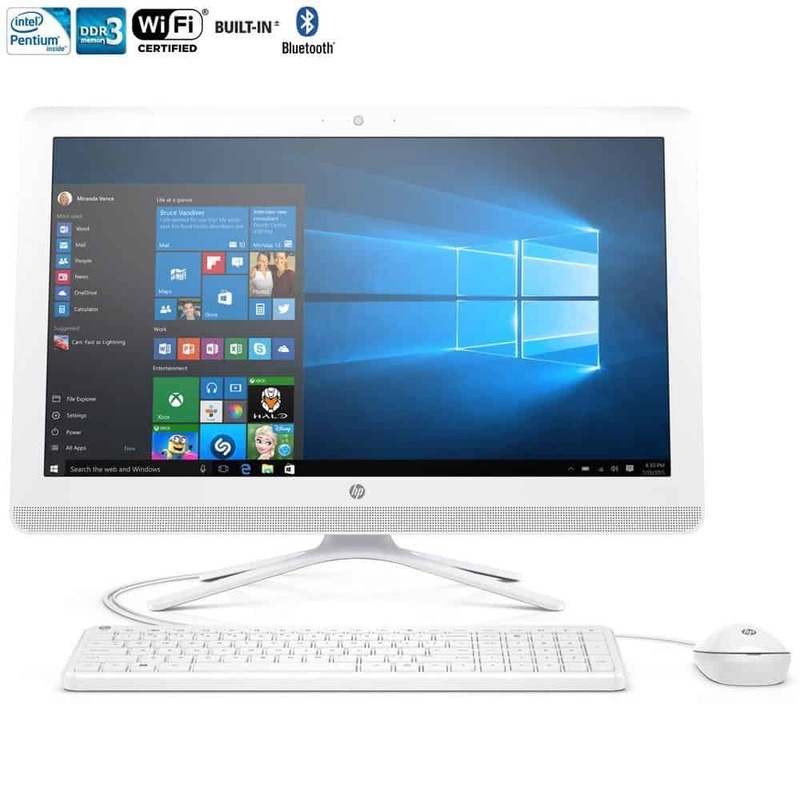 If you and your family plan on having an all-in-one desktop for moderate use (web browsing, multimedia, MS Office), the HP 22-b016 AIO make perfect sense. Also, consider the Aspire C24-865-ACi5NT AIO desktop, a great alternative for almost the same price. It packs a more powerful and recent 8th Gen processor which translates to better performance.